When you are looking to buy an inflatable hot tub, you will almost certainly have a lot of questions. Hopefully, our articles will answer some of these questions, as well as provide you with a lot of information and advice. 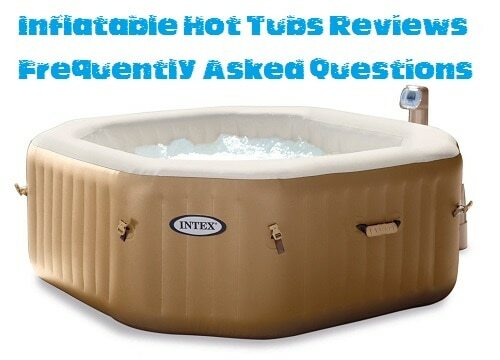 Here, though, are the questions which are most frequently asked by anyone looking to buy their first portable inflatable hot tub. How much does an inflatable hot tub cost? There is a wide variety of models available, as you’ll see from our reviews. These range in price from around $300 up to a top-of-the-range model costing several thousand dollars. There are a number of factors involved in the price of each model. These include the size, the number of massage bubble jets, the hot tub’s construction, along with the number of accessories which come as part of the package, such as hot tub cover, water filtration system, and so on. Your best approach is to define the price range you want to pay, and then look at our reviews to see which is the best model for your money. Generally speaking, inflatable hot tubs fall into three categories: Budget Models costing up to $500, Medium Price Models which cost from $500-$1,00, and Luxury models which cost over $1,000. You can check our reviews for each price range by clicking on the links for each. What size inflatable hot tub do I need? Put simply, the bigger your hot tub is, the more people you’ll fit in it. But big is not always better. The larger tubs are generally more expensive, and they take longer to fill up with water, and cost more to heat. So you’re better off choosing the model which best suits your lifestyle. You need to think about how many people you plan on getting into the hot tub at once. Portable hot tubs range in size from those which fit 2 people in comfort, up to those seating 8 adults or more. So if you’re buying your hot tub as a place of relaxation for just yourself, and your partner, then a 2-person model would be fine. However, you might be better off considering a 4-person hot tub, in case you decide to entertain or have visitors. A 4 to 6 person model would be perfect for a family, as this has enough space for mom, dad, and the kids, as well as any of your children’s friends. Finally, if you lead an active social life, and you see yourself having a lot of friends around to enjoy the delights of your new inflatable hot tub, then you’d be advised buying a model for 8 adults or more. When you think about the size of your portable hot tub, remember you will need some space around it so that you can get in and out easily. 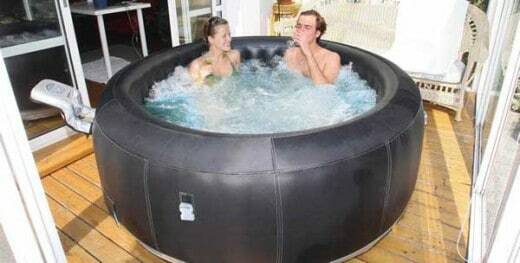 One of the smallest quality models is the Lay-Z-Spa Miami Inflatable Hot Tub, which measures 180 cm across in diameter. If you add on, say, 60 cm for ease of access, then you could easily fit this model into a space measuring 2.5 meters across. The great thing about inflatable hot tubs is that they are portable, so you can set yours up in any suitable spot. Just make sure the ground is level, and that you have enough space around it for access. Yes. As long as you choose a room with a solid floor, usually a room on your ground floor, as the water in your hot tub will be quite heavy. Make sure the room is well-ventilated, of course, as your hot tub does give off steam which will condense. Also, make sure to place your tub away from plug sockets and valuable items, just in case some water accidentally splashes, or there are drips when you get out. What about the electrical supply? Inflatable hot tubs are inflated, run, and heated by electricity. They come with a long cable which has a normal household plug on it, that you simply plug in to an everyday household socket. So there’s no need for any special wiring or paying an electrician. Do check that the electrical lead is long enough for you to site your hot tub where you choose, though, as we do not recommend using an extension cable. That does depend on the size of your inflatable hot tub, and how frequently you use it. From personal experience and having read hundreds of customer reviews, you should plan on it costing between $2 to $10 a week., depending on those two factors of size of your portable hot tub and frequency of use. How do I set up my inflatable hot tub? Make sure that you do not over-inflate your hot tub, however, as you need to allow a little give in the tub for the weight of the water. How long does it take to fill and to heat up the water? It will take around an hour to fill your hot tub, and then between 12-24 hours to heat up the water. The actual time depends on the size of your tub, as the bigger it is, the longer it takes to heat. Not very much. Simply wipe the inside of the tub at the water level with a damp sponge, to keep it clean. If you use a cleaner, do not use an every day household cleaner, as this might damage the water filter and pump. Instead, get hold of an inflatable hot tub surface cleaner from a site such as Amazon. Inflatable hot tubs come with a water filter system, so you will need to change the filter every few months, although this depends on how often you use your hot tub. You will also need a supply of chemicals which you add to the water, to prevent micro-organisms from flourishing. While your portable hot tub is not in use, you simply put a cover over it, to keep the water clean. If your hot tub does not come with a cover provided, it is easy enough to buy a cover which fits your model. For all the accessories you might need, check out our inflatable hot tub extras by clicking here. What if my hot tub gets a puncture? As long as you’re careful, this shouldn’t happen, as inflatable hot tubs are made of very strong material. 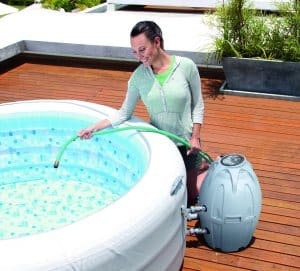 But with small children around, however, or simply an unfortunate accident with a decking nail or protruding branch, it is possible your inflatable hot tub might get a puncture and you’ll need to repair it. Your inflatable hot tub will come with everything you need to set it up and enjoy it straight away. Remember, though, that you will need to purchase a replacement filter for your model, as well as some more water purification chemicals,. Our advice is to buy a supply of these when you purchase your hot tub, as it puts your mind at rest knowing that you already have them when the need arises. Possibly. It depends on exactly where you live, and how cold the winters get. The bottom line is that you should not use your inflatable hot tub in temperatures below 40F. That’s because the PVC material the hot tub is made of will become brittle in such cold weather and will quickly perish. If you are lucky enough to live in more warmer climates, however, your inflatable hot tub is suitable all year round. Is it safe to use an inflatable hot tub if you have a medical condition? If you have any concerns about using an inflatable hot tub, please always consult a medical practitioner for advice. If you have any questions, then please Contact Us and we will answer them or point you in the right direction.